How Much Is Too Much To Drink Before I Drive? People often ask how much can they drink before they go past the limit? 1 metric tot is 8,4 g of ethyl alcohol. The average beer contains between 13 - 16 grams of ethyl alcohol. One beer is, therefore, the ± equivalent of a double eg brandy. In trials, all the participants (Male & Female students) exceeded the legal limit = 0,05g/dl after two beers. "r" = Widmark factor which is on average 0,7 for men and 0,6 for females. c = blood alcohol level. Blood alcohol level = A divided by p x r x 10. Usually, on any bottle, the % of alcohol is indicated. 10% would imply 10 grams/alcohol per 100 ml of wine. 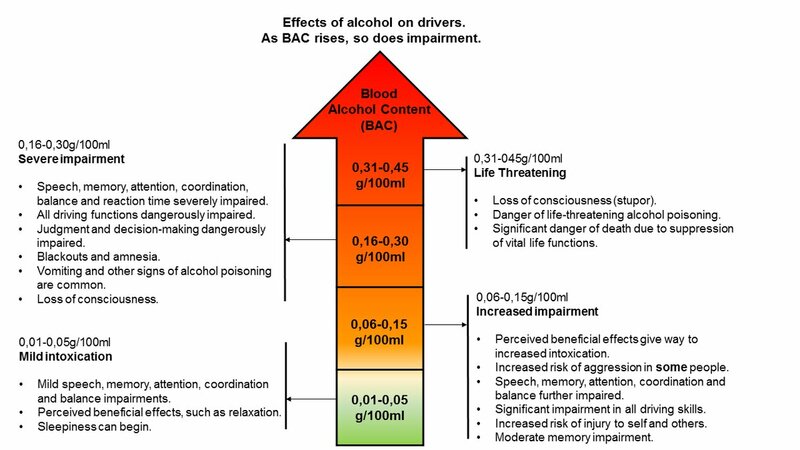 Then once again the Widmark formulae can be applied to get an estimation of expected blood alcohol level. Many other factors determine the uptake of alcohol. Volume, strength, type of dilutant ( eg Coke), type of meal, medication, previous operations, temp of drink, the water content of organs, diffusion gradient, the rate of blood flow, any GIT disease etc. The effects vary from person to person. No set pattern of behaviour does exist. We do not wish to elaborate on all these factors. As you can probably deduct, there is not a simple answer to the question !! 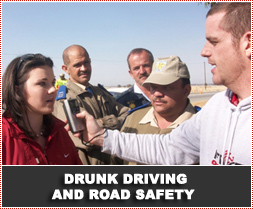 Visitors to the Arrive Alive website often ask how many drinks they may have before they go on the road. This is a question we need to approach with caution. It is important to recognize that there are too many variables to provide an exact answer - and we can only provide a rough guide. It is also important to recognize that this is only a guide to what might keep you within the legal limit. If the question is “How many drinks may I have before my ability to drive is reduced?” - the answer would be NONE! We would rather like to recommend that you DO NOT drink before you drive and that you plan ahead and have a sober designated driver take you home! The basic guideline in South Africa is that 2 drinks within 1 hour will put you on/over the legal limit so don’t drink more than this if you will be driving. Alcohol can also contribute to inattentional blindness - the failure to detect unexpected salient objects that appear in the visual field of the intoxicated person. To conclude - do not drink and drive!